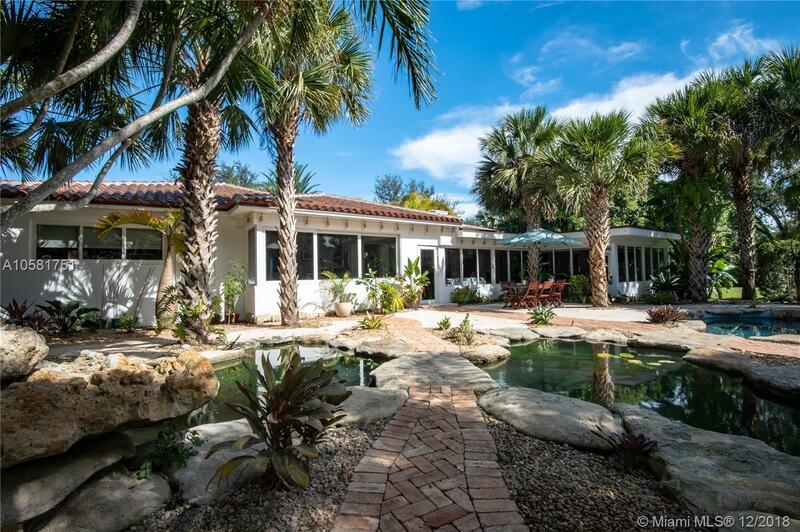 This charming updated 5 bedrooms, 5 baths Pinecrest home sits on a beautiful acre lot. The spectacular back yard has a resort feel to it. The tropical vegetation sets the tone - the oversized rock pool & water fall blends in an exotic atmosphere with an outdoor bar & tiki hut, a koi pond & an eco friendly chickee hut & more room for a tennis court! The home was fully updated with beautiful Californian oak wood floors throughout, impact windows, updated bathrooms & a new roof. The open spaces & bright light give the house a European vibe. The kitchen is equipped with top notch appliances, sub zero fridge, Wolf gas range, 2 Wolf dishwashers, 2 Wolf ovens & a Wolf microwave. The charming house is minutes from A+ rated International Private & Public schools, fine dining & shopping. Directions: East Of Us1, East Of 67th, Home Is On Chapman Field Drive, One Block From Red Road.